Down 29-24 to the Dallas Cowboys with less than a minute to go, the Pittsburgh Steelers set up to spike the ball—except they didn’t, with the fake-spike play giving way to a Ben Roethlisberger touchdown pass to Antonio Brown that gave the Steelers a 30-29 lead. 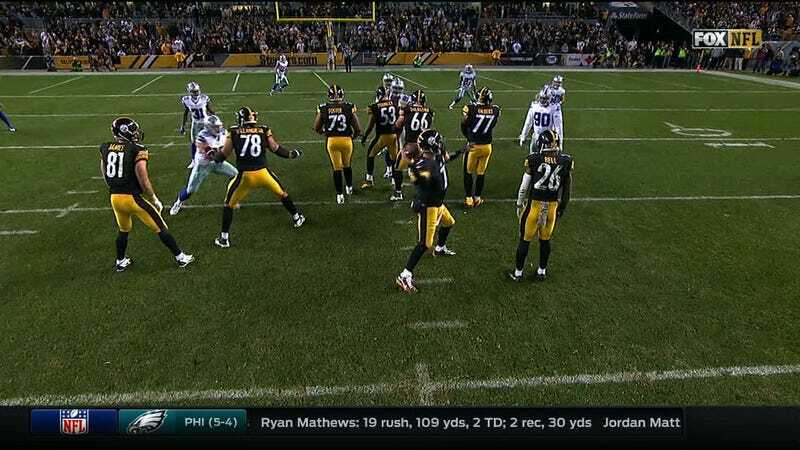 It was the Steelers’ second touchdown in the fourth quarter, but it wasn’t enough. The Cowboys got the ball back with 43 seconds left, and three short passes from Dak Prescott plus one 32-yard touchdown run from Ezekiel Elliott gave Dallas the 35-30 victory.